I spent much of the week coiled like a spring in anticipation of the upcoming bank holiday weekend. So yesterday morning I woke with the larks, ready to leap into action with clearly no need of my daily Berocca. Scrubbed, preened and coiffed, I packed a scrummy picnic and called out to Hercules to finish polishing his wing mirrors and to get us to the Ouse valley pronto, so that I could unleash some energy. Situated in 200 acres of glorious countryside with unobstructed views over the rolling Sussex Weald sits Borde House and gardens, our destination of the day.The Elizabethan Tudor mansion built in 1598 is home to the Clarke family who have been in residence for over four generations. Upon gazing out of their dining room window they could quite easily see me, fuelled on sandwiches and fizzy pop, cartwheeling across their lawns, running through the bluebell woods, watching Treecreepers ascend majestic trees, looking for tadpoles in the beautiful Italian garden pool, following bumble bees around the Azalea ring and generally noseying around. The primary objective of our well timed visit was to see the extensive and diverse collections of rhododenron and magnolia which hail from as far afield as the Himalayas, China and the Andes and are currently at the peak of Technicolor perfection. Several hours later, with energy levels subsiding, Hercules scooped me up into the rear seat of the car while I dozed all the way home, dreaming of returning to Borde Hill in the summer to see the infamous Rose garden designed by Robin Williams in all it's glory. Our fab Giveaways will make a return at the end of the week, stay tuned for details! Paul, you always have the best adventures! A beautiful house, park, garden...what more could one ask for! A lovely adventure, made all the more perfect by your delightful description. 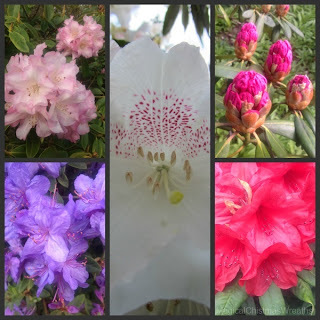 Great photos, peak rhodo season. Our PJM is just coming into flower...hummingbirds will soon appear. It was very nice to see Burgess Hill on the sign; we used to visit family there one time, many years ago. I hope you are enjoying your Bank Holiday today. Dear Paul - I have never heard of Borde House before but it looks idyllic - I love the half apple - wish I could have the other half. I think that you must have been down on your knees taking the tulips - its a fabulous photo - but no doubt Hercules was on hand to help you up again. It is so nice to see you on your blog and to have you gallivanting around again. What a fun excursion..thanks for taking me along! Looks like another fabulous English garden and home. Loved to get here..Maybe on my London trip ! I love seeing what's blooming in other parts of the world and these photos were gorgeous. Hope you had a fun holiday! Sounds like you squeezed a lot out of the day. Lovely gardens Paul - the English still do them best! Noticed the signpost and see that Crawley and Horley were not far so that means Borde Hill is pretty close to Gatwick, right? I used to fly into that airport direct from here but sadly they changed it to bigger and busier Heathrow a couple of years back. What a magnificent Tudor manor house - lovely to know it's remained in the family for so long. White Bleeding Heart (Dicentra spectabilis alba) so perfect, and almost impossible to find/grow over here for some reason. If I could grow that herein the hot/humid south, along with lupins and delphiniums, I'd be a happy gardener!!! Happy week - I know you are enjoying great weather. Lovely gardens! What a beautiful place! And the blooms are extraordinary! I do love Spring! English gardens are amazing , dreamy places to visit or to be inspired of... I love your posts! I can SO see you cartwheeling across these delightful lawns and just seeing your stunning photos from this petal paradise makes my arms and legs twitch in a cartwheel-inspired manner too. I love the last image of the tulips in the foreground and the view of the garden 'room' beyond, waiting to be explored. Thank you for taking us on yet another journey of garden and mansion discovery - my wish list of excursions-to-make is now getting LONG! I know I have said it before, and with the risk of repeating myself, could I just say how much I love your writing, your wit, your ability to bring the reader right into your story, place us just under the magnolia tree and show us around with you as our personal guide and let us giggle at the sight of your cartwheeling and following bumble bees around. You are a very talented man, Mr Paul! Oh my goodness...as my own garden is badly in need of help I so enjoyed this tour...absolutely breathtaking! Dear Paul, What an exciting Day Trip. The grounds and gardens are stunning! Love the spring flowers in all of their glory! Come and see me soon...miss your visits..
Oh, Paul, I am so jealous that I will probably never see this beautiful edifice. Simply splendid. And, your narrative made it so much more enjoyable. I am seeing you doing cartwheels across the garden...good job! What a lovely way to spend the day! I've never seen white bleeding hearts...beautiful. Oh my goodness Paul-- what a beautiful place to visit. This is the same as me getting to visit the Biltmore mansion-- their azalea garden is also spectacular. Your photos are simply stunning-- such beautiful spring color-- I'm sure you stayed all day taking pictures! !